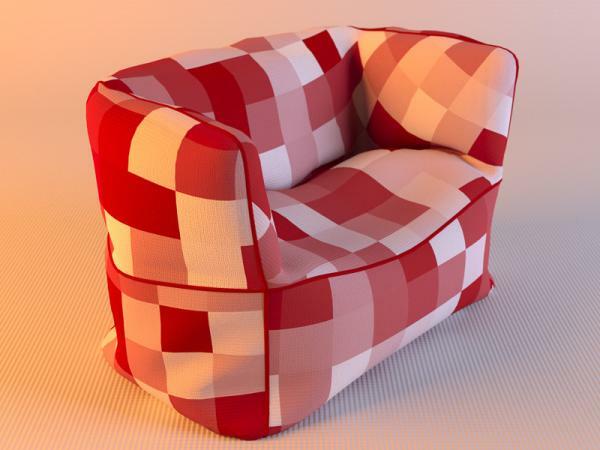 This detailed 3D Bag Chair is available as a native 3dsmax 2012 scene file (.max), and also in several scaled .obj formats, for importing easily into other applications, like Blender, Poser, or Daz|Studio. This versatile model comes complete with several fun and wild high-res COLOR texture maps to choose from. The model's UV coordinates are also perfectly suitable for use with any tileable image, or procedural textures. There is also a high detail BUMP and SPECULAR map included to use in those map channels respectively. All provided texture maps are in .jpg format, and at 2048 X 2048 pixel size; perfect for extremely close-up rendering. The topology of the model is 100% quads (quadrilateral faces), with a detailed, but optimized poly count of just 8,528 total polygons, and 8,530 verts. There are absolutely NO triangles or Ngons in this model, and no overlapping UV's. The original UV Template of the object is also included in the "maps" folder as an uncompressed .PNG file, to make your own patterns or textures from scratch, if you wanted. You are free to use or modify this model as you see fit for your own projects or scenes; it's great as a decoration in a room, or as a comfy character prop. The model can be used for both commercial and non commercial renders. You may not, however, resell these objects, or any derivative of them; individually, or as part of a package/set. A whopping big thank you for this fantastic chair, is looks perfect in any comfy loft you care to mention. very nice. thanks for this and all other great offerings. genaris (4 years ago) Inappropriate? Wonderful item, great style, fun vibe, and a nice organic sense to the modeling. Thank you! SteakBarker (5 years ago) Inappropriate? Damn good job. If i hadent seen so many model before i would have said this was real! Looks sooo comfortable, I guess I'll make a 3D-Print so I can sit on it, lol... Thanks for sharing this! Rori2RA (5 years ago) Inappropriate? Love this couch...looks so inviting..Cheers!! reese (5 years ago) Inappropriate? JodeeM (5 years ago) Inappropriate? Hi , tried to upload a few things to a world online... (Island Oasis) and cant get it into world .. any suggestions? Bailey48 (6 years ago) Inappropriate? A great looking chair, thanx again for posting great stuff!!! Fantastic little chair, very nice, Thank You! mdamlady (6 years ago) Inappropriate? Looks fantastic, can't wait to try it, thank you.